Take a look at a selection of our testimonials to see what our previous clients have said, or if you would like to read them later, click the PRINT icon above. Can’t praise this band enough. They played at our wedding last week. They played two live music sets, with a mix of music that got all the guests of every age dancing. They also finished off the night with a fantastic DJ set. The part of the night that we enjoyed the most, was our first dance song, that they played live. We booked the Deltatones for our wedding and we couldn’t have been happier with what they gave us. They played our first dance song live and it went down a storm. They judged the mood of our guests with their set brilliantly. Building up to at least 3 dance circles that I can remember before the end of the night. The Deltatones played at our daughter’s wedding yesterday, they were absolutely brilliant, had everyone from aged six to 91 up dancing. On top of that, they said I was the coolest mother of the bride ever because I like David Bowie and they played one of my favourite tracks from my favourite Bowie album – what’s not to like? The Deltatones played at our wedding in Leasowe Castle on 8th November. They were fantastic!! Everybody was up dancing and the atmosphere was great! Thank you so much for providing outstanding entertainment!! We would definitely recommend The Deltatones to anyone! The Deltatones are amazing! They played at my sister’s wedding and were so fantastic that when my husband and I got engaged we had no hesitation in booking them for ours. Their live music was brilliant and kept the dance floor full all night – and they happily accommodated our love of 90s hip-hop between sets! Not only are they incredibly talented but they’re incredibly nice guys as well – thank you for an awesome night! Fantastic music and singing thankyou so much really enjoyed it . Thank you so much guys. You did a fantastic job last night, everyone commented on how good you were. We really appreciated that you managed to incorporate all our songs, especially the finale of Loch Lomond! Derek says he’ll be in touch about the house warming party! Absolutely amazing!! Thank you so much for getting everyone on the dance floor (including our rather ‘merry’ friend Joe and the best men/ushers taking on ‘Valerie’) Many people have commented that you were the best band they have heard at a wedding and we agree. Thank you for being such gentlemen and such a talent. We would just like to say a massive, massive thank you for performing at our wedding in Thornton Manor last Thursday. You guys were fantastic. You went above and beyond for us, learning our first dance song (even though we know its not your thing!) our guests loved you both and we would certainly have no hesitation in recommending you. We hope we get to see you play again one day! Hi Rob, Apologies for the delay in getting back to you . We just want to say that you provided us with a fabulous way to end what was a wonderful day for us. The music was seamless, totally balanced and you used the acoustic to perfection. There were so many comments about your high standard of music- not least, most of the guests are top musicians so that says a lot. The first dance (We can rule the World ) was great and as you can see from the pictures, everyone enjoyed themselves. I shall recommend you both highly and when a ‘special number’ birthday comes along we shall probably book Davenport house again of course- you two! You are both lovely fellas! The best duo we could have chosen! Incredibly friendly, professional, helpful and in the words of our guests ‘the best entertainment they had ever seen at a wedding’! We could not be more grateful to The Deltatones for helping make our wedding such a perfect occasion. Great job!!! Last night was amazing, everyone really enjoyed it. It was great to meet the both of you, I hope you had a safe trip back to Liverpool! The only requirement that Kay had for her dream wedding was to have a live band, and you’ve made that dream come true. Thanks guys for playing at our wedding on Sat 3rd August. Everyone has agreed you were absolutely amazing! Just brilliant. Every song was on the money, the dance floor was full all night and everybody commented on how good you were. Who needs a 4/5 piece band when you two perform like that?! Your DJ sets were also fantastic, you read the crowd beautifully with your song choices. One girl danced so hard she had to see a chiropractor the week after! A huge thank you from both us. Thank you so much for performing at our wedding at the Alicia Hotel on the 6/7/13. Everyone loved you and to get such approval from my guitar playing dad is no mean feat! Your playing and singing is phenomenal and lots of people already asking for your contact details. Would use you again in a heartbeat and intend to when the occasion comes…. Thank you very much for doing the music and disco for our wedding . Your music was the best I have ever heard at a wedding, everyone we have spoken to so far have commented that you were brilliant. I’m sure that you are destined for bigger and better things, and we will be saying/ bragging that the Delta Tones did our wedding. I’d just like to say a huge thank you on behalf of Catherine and myself for playing at our wedding. We couldn’t have been happier with the songs you played and the way that you play them. 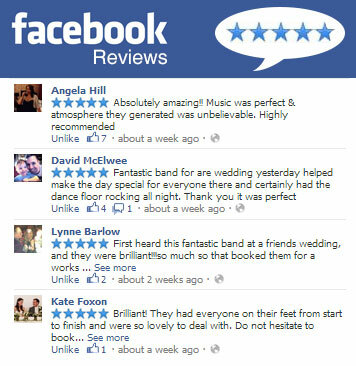 We have had lots of positive feedback from many of our guests saying how much they enjoyed your band. We will definitely be recommending you in the future. All the best. “Just off on honeymoon and we are talking about how amazing you were for at least the tenth time today. Proud Mary was literally the best wedding moment of the whole day for me! The live set was brilliant – and the disco was fantastic too. Nancy Clark – Entrepreneur Of The Year Global Program Manager (Ernst & Young WEOY Awards 2012, Monte-Carlo). My wife and I hired the Deltatones for our wedding and they might have been our favourite part of it!! They were by far the best band we researched (and we researched A LOT). The guys were fantastic and really accommodating (especially as my wife destroyed their set list before they even started! They will now be playing my sister-in-law’s wedding, so looking forward to seeing them again! Fantastic night tonight working with these guys . Absolutely top notch and a real pleasure to work alongside . Thanks guys you were fantastic! great band, awesome vocals. would defo recommend. To add, i am very fussy when it comes to live bands and these guys truly deliver! great cover of Mr Brightside!